We ordered the new appliances for our kitchen last weekend. I’ll make a general post on how I bought the appliances, and I’ll also put up another post describing my other appliances but I thought the range deserved its own post. In a previous post, I talked about why I chose a gas range over an induction range. 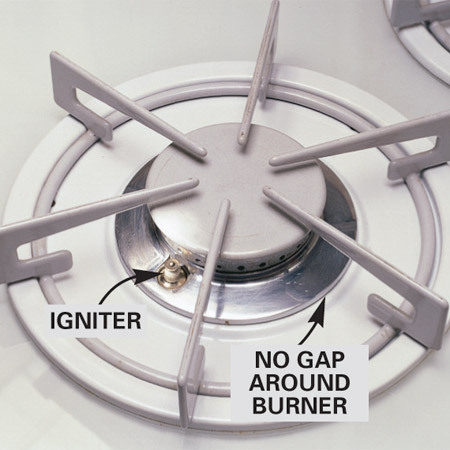 Gas ranges come with two different type of burners: open burners and sealed burners. Image of a sealed burner. Sealed burners are designed to prevent spills from entering the internals of the oven. Fans claim they’re easier to clean but they have three attributes I don’t like. Flame Pattern: Because the burners are sealed, the flame doesn’t shoot straight up but instead comes out of the sides of the burner. This creates a heat “donut” on the pan, rather than the more even heat of an open burner. Power: For reasons I don’t understand, open burner ranges are available with more power than a closed burner. We do a lot of searing in our house and I wanted a burner that would get really hot. I also hate waiting for water to boil. Further, I’ve never heard anyone complain that their range was too powerful. Cleaning: In my previous house, I had a sealed burner range, whenever anything spilled over, it meant scrubbing and scrubbing to get the junk off and I always struggled getting the very edge where the burner sits on the range clean. With an open burner, spillover will fall into a catch tray which can be covered with aluminum foil. Cleaning that seems easier but I’ll put up an update when I actually have the range and have to clean it. Given my desire for an open burner, I had three companies to choose from: Blue Star, Capital, and American Range. I quickly dismissed the American Range, when I saw it in person I found it clunky and I wasn’t happy with the build quality. I also didn’t like how poor the information on their website was, there were typos and inconsistencies between what the website said and what the vendors said. The American Range Performer (American Range’s open burner range) is also relatively new and hasn’t been on the market too long so it was hard to find actual reviews of it. The competition came down to Blue Star versus Capital and I hate to say it, but I don’t have a good reason for choosing one over the other. They’re extremely competitive ranges with marginal differences between them. The Blue Star has two high power 22,000 BTU burners, a simmer burner and a 15,000 BTU standard burner. The Capital has four 23,000 BTU burners and claims that they can all simmer. Reviews online make me believe the Blue Star wins when it comes to simmering but that’s not a very common use case and I’m convinced I can get a good simmer on the Capital as well. Both ranges offered a grill and both have infrared broilers. The infrared broiler is a feature I’m really excited to try. The infrared broiler produces 1800° F heat. A traditional broiler is closer to 550°-600° F. I want an 1800° F broiler to be able to cook steaks the way Ruth’s Chris does. Ruth’s Chris has custom designed broilers that cook both sides at 1800° at the same time. Mine at home won’t be quite the same, but I’m hoping to get close. This decision took months, In the end, I chose the Capital Culinarian for a couple of reasons: I liked the fit and finish more and I also liked the flexibility of having all four burners be the same. Here’s a stock photo of my new range. I’m looking forward to having a grill inside the house! Grilling indoors adds a lot of complication, you need to plan your ventilation solution around the extra smoke that grilling will produce. I won’t be able to do super messy grilling like you would with an outdoor grill because the cleanup will be more work, no sugary marinades or very greasy meats. What I will be able to do is easily mix grilled foods with other foods when cooking. I think the first meal will be steaks cooked with the infrared broiler, grilled asparagus, and sauteed mushrooms. If you’re curious about how I’m venting this range, see my ventilation post. Thank you for your informative post. Although far from being a chef, per se, I have also been in search of open burners for cooking (more even heating, and control). I will definitely be looking into the two companies you cite. Thanks!! Seattle Ballard resident here has enjoyed reading your blog. We bought our house ~1.5 years ago and are considering a kitchen remodel of mid 1950s kitchen Capital is on our list along with Bluestar. Still happy with your Capital? One of the sales staff at Almvig's tried to steer me away from it saying 2/6 ranges they ordered in the past year have arrived damaged. I still love mine and I would buy it again! I think the Bluestar ranges are also great, and I don't think you can go wrong with either! My range came without problems. Yikes! You're right! I've pulled the photo. I realize this post is old. But, have you been able to duplicate Ruth's Chris steakhouse style steak with the broiler? You know, I tried using the broiler three times before I decided I didn't like it and went back to using cast iron. The cast iron gets so hot that my steaks come out amazing without using the broiler! Koz, Did you get the built in grill with your Capital? If so, do you like it? Does it take a long time to heat up? I did! I love it. We use it all the time, it does take a little longer to heat up than my outdoor grill and I have a cover I use with it: http://amzn.to/1PE82Vf. This helps with the cooking but I would definitely get it again. Previous PostPrevious I love my heat pump. Koz on How and Why I moved my gas meter. Evan on How and Why I moved my gas meter.